Dawn on Feb 28. An auspicious day. 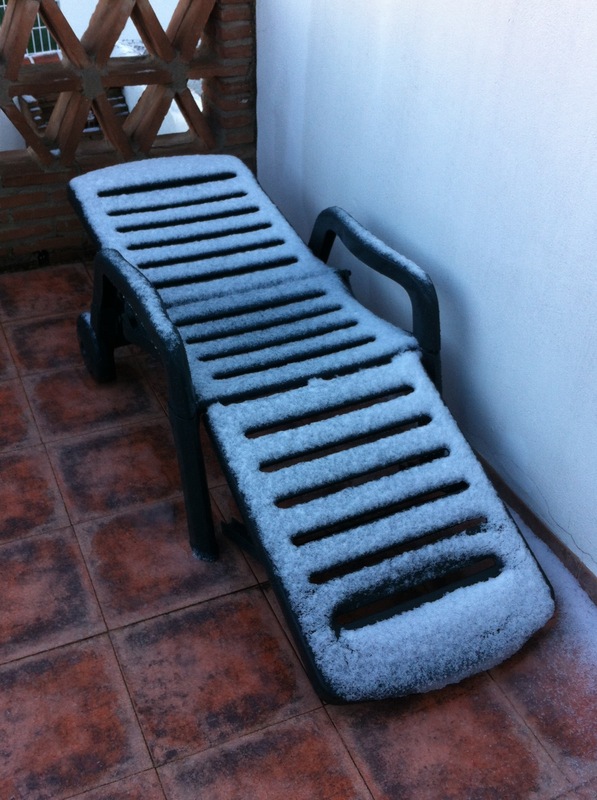 The end of the pope’s time in office, Andalucía Day, and snow in the village. The first of these passed me by entirely without impact. The other two mattered. Snow in the village! 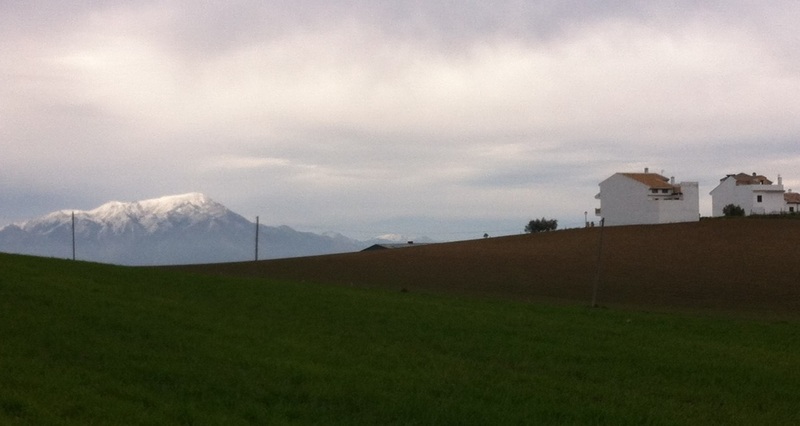 Yes we’re high up at over 700 metres but usually the snow starts at 800. It settled in the square and on the cars, and the views of the surrounding mountains were stunning. So the woodburner was lit, soup taken out of the freezer, and I hunkered down for a day indoors. Andalucía Day, normally a time of great celebration with music, dancing and free paella, appeared to be cancelled. “No hay dinero,” the Ayuntamiento had told me. “Hay un crisis.” But at least most people had the day off work and despite the weather could get together with extended families. By 10am cars were loaded and with much waving and shouting the neighbours slithered off on slippery roads for shared eating, drinking, and general merriment. By mid-morning the sun was out and the distant views of La Maroma capped in sunlit snow were being captured by cameras from all directions. Facebook exploded with pictures of snow in Spain. 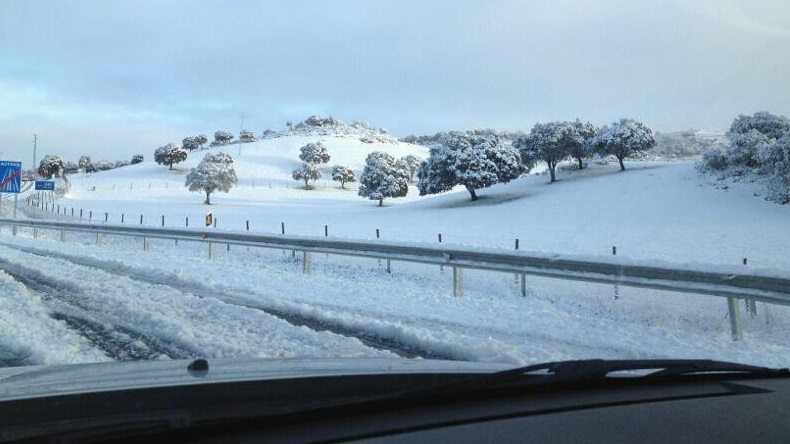 Michael Soffe’s picture of the road near Antequera caused a flurry of panic amongst drivers. 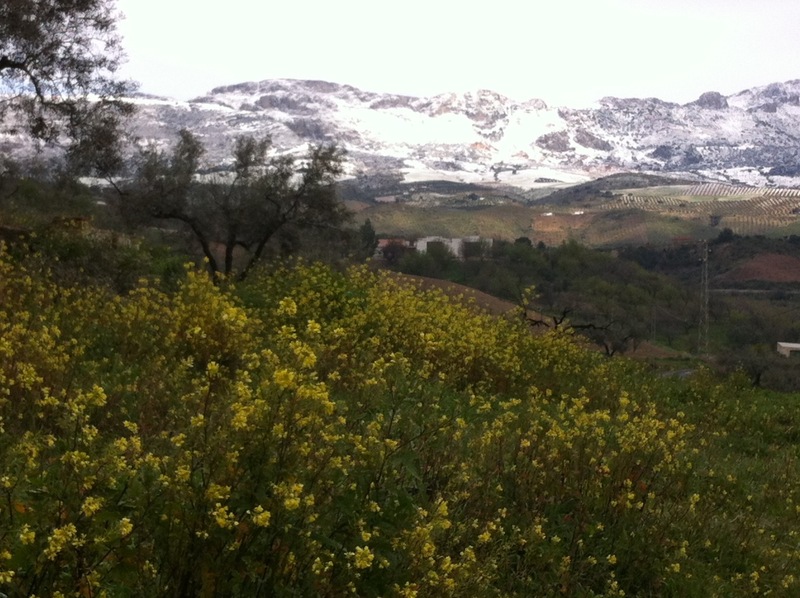 I loved the contrast between Colmenar’s flower-covered hillsides and the snow on the surrounding mountains – what a difference a hundred metres or so makes! The goat on my regular circuit was staring at the snow with a baffled and disgruntled expression, but the fat golden chickens seemed to enjoy pecking at the small patches that had settled behind their feed trough. Despite Andalucía Day the bakery was open as normal in the morning, so after my walk I had warm fresh bread to take home. I met with a fellow blogger in the afternoon, and her husband told of the snow they’d had in their village last year. “First snow in the village for twenty years!” the locals had gasped then. Snow had fallen on them too that morning. “Ooh, first snow in the village for thirty years!” gushed the locals. “Umm, apart from last year?” he pointed out. There is that tendency here, too. “It hasn’t settled in the square for over ten years!” I was assured. Really? I’m sure John, the previous owner of Bar CO2, had mentioned snow in the square, and he wasn’t here ten years ago. Later Lorenzo (my neighbour’s brother and a professional builder) popped in to quote for damp-proofing and re-plastering the wall that the estate agent had promised he was fixing. Since the road has been resurfaced rainwater is no longer routed directly onto my window-sill so the problem shouldn’t arise again, but the damp that was so obvious when I viewed the house still needs to be sorted. Why does one ever think estate agents might suddenly turn out to be honest? So in the end Andalucía Day was as irrelevant as the exit of the pope. But my friends and I enjoyed tapas at the Balcón de los Montes, the snow was pretty, and my home-made asparagus soup was delicious. The “harder side” of the winter was not as unbearable as the newspaper had made out. This entry was posted in Spain and tagged Andalucia, Axarquía, facebook, Shaftesbury, snow, Spain, SpanishBlog, Tamara Essex by tamaraessex. Bookmark the permalink.